Crowds have gathered across the US to protest against Monday's decision not to charge a police officer over the killing of black teen Michael Brown. Demonstrations from New York to Seattle were mostly peaceful, with protesters chanting and waving placards. 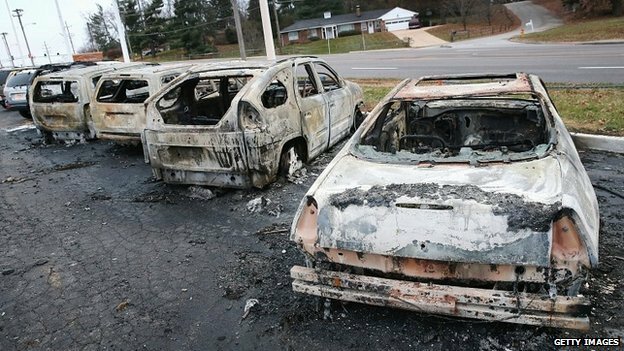 In and around the St Louis suburb of Ferguson, scene of major riots on Monday, 2,200 National Guard troops were deployed to stop further unrest. Meanwhile, the officer who shot Mr Brown said he had a "clean conscience". 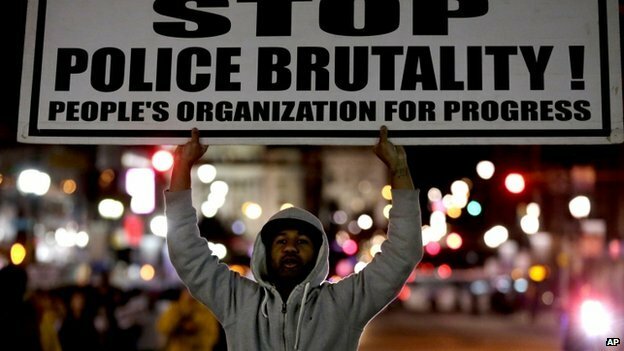 Darren Wilson shot Mr Brown, 18, on 9 August in Ferguson, Missouri, sparking weeks of unrest. The grand jury's decision. announced late on Monday, means the police officer will not face state criminal charges over the shooting. Lawyers for Mr Brown's family have denounced the grand jury's decision as "unfair". 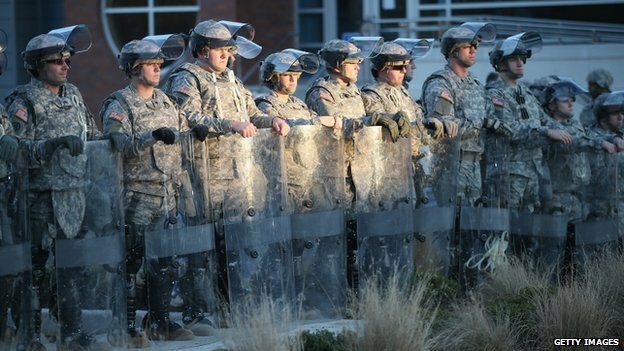 With the number of troops more than trebled, the situation in Ferguson was calm on Tuesday, though tension outside the central police station began to rise as the evening wore on, the BBC's Michelle Fleury reported. Earlier, demonstrators briefly closed a major road in central St Louis and rallies were staged outside the federal court house. Speaking from Chicago on Tuesday, President Barack Obama said there was "no excuse" for destructive behaviour and criminal acts of rioting, adding that those responsible should be prosecuted. The frustration seen by the grand jury's decision, he said, had "deep roots in many communities of colour who have a sense that our laws are not being enforced uniformly or fairly". 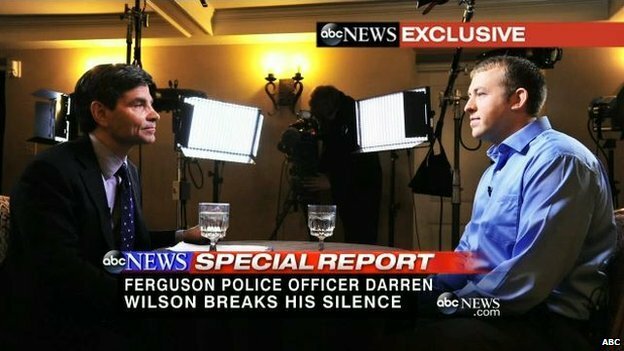 Much of the debate since August has centred on whether Michael Brown was attempting to surrender to Darren Wilson when he was shot. Protesters in Ferguson and beyond have chanted "Hands up, don't shoot," in reference to claims by some witnesses that Mr Brown had his hands raised. Speaking to ABC News in his first public comments, Mr Wilson said there was nothing he could have done differently. He said he feared for his life. "The reason I have a clean conscience is because I know I did my job right," he said. 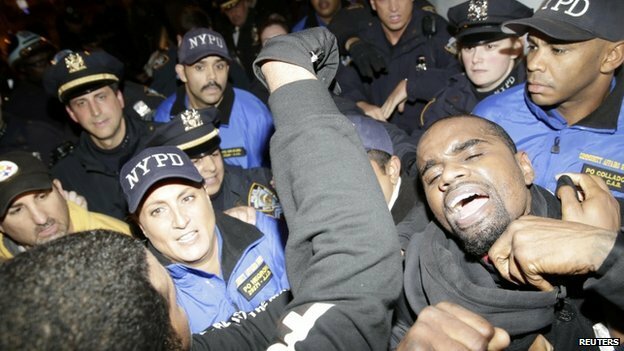 He described Mr Brown as a "powerful man," saying he felt "like a five-year-old holding on to Hulk Hogan". The policeman, who has been on administrative leave since the incident, denied witness statements that Mr Brown put his hands up. He insisted that race played no part in the confrontation and that he would have acted in exactly the same way if the suspect had been white. More than 80 people were arrested amid riots across several areas of St Louis on Monday night. Sixty-one of those arrests were in Ferguson, with charges including burglary and trespassing. One police chief described it as the worst violence the town had ever seen. 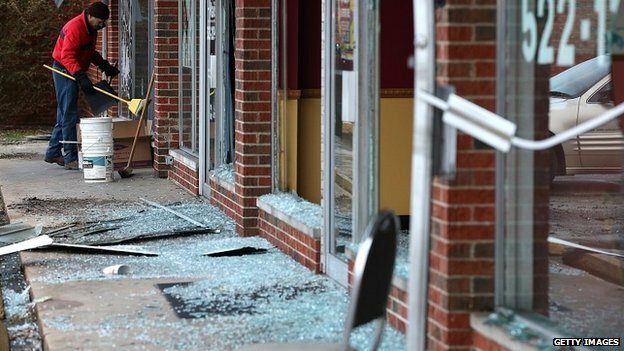 Ferguson mayor James Knowles criticised what he said was a delay in deploying the National Guard, complaining that it did not come soon enough "to save all of our businesses". "Lives and property must be protected. This community deserves to have peace," Governor Nixon said on Tuesday, explaining his decision to bring in reinforcements. Michael Brown family lawyer Benjamin Crump earlier described the grand jury process as "broken", but also said they condemned the violence that followed the decision. Civil rights leader Al Sharpton said the prosecutor's decision to announce the verdict late at night on Monday was "irresponsible". Many in Ferguson's predominantly African-American community had called for the officer to be charged with murder, but a Missouri grand jury - of nine white and three black members - made no recommendation of charges.